Ordinarily, you can shunt box cars or reefers wherever you like and just declare that they are “empty” or “loaded.” One problem with mining layouts is that the mined mineral is transported in open cars or wagons. So for realistic operation, you can’t really return an obviously loaded ore car to the mine. Yurze Ore Mine is a micro variant on John Armstrong’s classic solution to this problem, which he called “empties in, loads out,” or vice versa. This tiny On18 (O9) or HOn3 (OO9) road uses a hidden sector table to receive and dispense loaded and empty cars at both ends of an ore-carrying industrial tram railroad. A small diesel loco pulls three or four loads from the ore mine using the backstage track, and hauls them around the bend, over the impressive trestle bridge, to the smelter. Pulling into the runaround track, the loco moves to the rear of the train and pushes the loads into the smelter (and back onto the “loads” track of the sector table, which you have surreptitiously swung over). The loco picks up a string of empties, returns to the mine, and deposits the empties in similar fashion. Then the maneuver is repeated. Each train can make as many laps of the loop as you wish in between deliveries, and there are lots of interesting scenic goodies to look at along the way. If there’s too much track crammed in for your taste, just use two engines and eliminate at least one runaround track! Yurze Ore Mine provides a perfect solution for the dilemma illustrated so well by Armstrong — he shows a picture of a model railroader backing a string of loaded ore cars into the mine. Another modeler says to him, “Hey, Joe, didn’t the boys down at the smelter want the stuff after all?” That situation never arises at Yurze Ore Mine! Magic Fingers Mine is a small but intensively worked producer of tintinnabulum ore, sold to rock bands to enhance the sounds they make at concerts. The stuff is expensive and hard to extract from the ground, so trains are limited to one or two cars at a time coming down the hill to the interchange. A well polished 16.5mm gauge railway does the job — in either HO, On30, or Gn15 scales. In contrast to highly automated “Empties In, Loads Out” operations (see Yurze Ore Mine above), this one is completely manual. The behind-the-scenes operator lifts the loaded cars from the hidden interchange track and places them on the proper track within the mine. He also removes empties from the mne track and places them on the proper interchange track. Four-wheeled cars are recommended. After delivering a couple loaded ore cars to the interchange siding, the line’s small but powerful locomotive pulls a pair of empties from the interchange track, along with perhaps a short boxcar or gondola of mining supplies. After sorting the consist in the tiny yard, the loco attacks the Big Hill. It’s slow going, which gives the operator a chance to exchange the appropriate cars behind the scenes. After a switchback maneuver (a good spot to try automatic train control), the tiny train reaches the top and shunts the mine and the mining supplies warehouse. Then, pulling a pair of loads from the mine, it proceeds down the hill to the Interchange tracks, to repeat the performance. While the little train is en route, the operator once again exchanges loads and empties backstage. It requires small ore cars and short locomotives, but you can build this authentic ore-handling road on a four-foot bookshelf. Grades are about 7%, which nearly any model loco can handle with ease under these light loads. Running the backstage operation will require a little practice, but the effect on spectators can be electric! 7/8″ Trains on a Shoebox Plan! John Dale, who lives in a village called Shepshed in the “centre of England,” is a garden railroader who decided to bring his big trains indoors for the winter. And John’s trains are really big …. 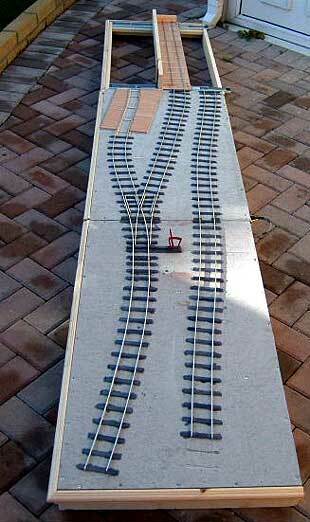 7/8n2 scale (1:13.7), which uses G-gauge trackage (45mm or 1.75 in) as two-foot gauge prototype track! Seven-eighths of an inch represents a scale foot. In order to run these giant models indoors, John decided to use a micro layout plan — specifically the plan of Carl’s Imports which is an HOn30 design to fit in a shoebox. Needless to say, in this Large Scale model, the plan does not fit in a small space … in fact, it’s about nine feet long (114×21 in or 290×54 cm)! But the plan’s the same micro design, except John has improved it in several important ways. He calls the result Defiance Mine. The finished railroad will haul ore from a single-chute tipple on the long spur at the lower right, to the offstage crusher or mill reached by entering the traverser on the middle track. Trains will use the traverser at least twice to deliver the ore. Wagons in transit can be spotted on the middle track while the loco runs around them via the traverser and engine shed, to be able to shove them into the mill. John’s first 7/8″ scale loco (in fact his first 1:13.7 model!) is shown at the top. It ‘s the result of seeing an article in Finescale Railroader magazine about a scratch-built 7/8″ Porter on a Bachmann G scale Porter chassis. John was hooked. John’s traverser (transfer table) is an important element of this model, and it’s a layout feature that I get a lot of email about. So I asked John for a more detailed look. At right is a closeup of his traverser, made from two hardware-store drawer runners. The deck is a spare piece of floor laminate. As long as the bracing is very sturdy, these will give years of smooth and reliable service. Indexing the table is handled by a spring catch (far right). John’s description of the spring catch construction: “It’s a length of 3/8″ brass tube with a turned brass bearing (bored 3/16″) in each end.A length of 3/16” steel rod has a collar marginally less than the diameter of the tube fixed to it. A spring fits between this and the top bearing , and the bearings are then soldered to the tube. I turned the threads off an old gear wheel to form the knob on the end of the rod. “The unit is fixed to a piece of 1/16″ printed circuit board ( or metal) with 4 holes drilled for fixing. The rod is hence sprung downwards into a 3/16″ hole drilled in a strip of metal that is fixed to the base of the traverser to locate the tracks. 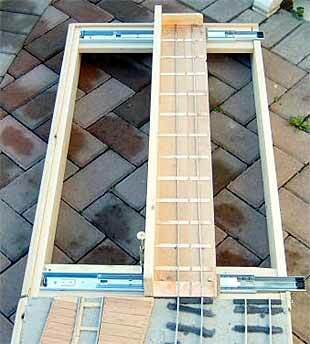 Pull up rod to release.” Ingenious! Although John’s layout is considerably larger than most of the plans in this collection, I think it shows the proper “Micro Spirit” — not to mention a lot of ingenuity — and so I wanted to bring it to your attention. For more information about 7/8″ scale, see Steve King’s website on the subject. For some random photos of my own explorations in this wonderful, gargantuan scale, click here. To view another approach to large scale adaptation of Carl’s Imports in a much smaller area, see Carl’s Exports.